Grape vines sit among the scorched ground ot the Robert Sinskey Vineyard in Napa, Calif., Oct. 9, 2017. The wildfires burning through Northern California are sending visitors packing, threatening the $2 billion-plus spent annually by tourists on wine tours, fine food, limousine rides and much more, business leaders said. At the Inn on First bed and breakfast in the famous wine town of Napa, co-owner Jamie Cherry was encouraging callers to postpone rather than cancel visits, as wildfires burned largely unchecked across the region. "People are canceling as far as November already," Cherry said. "It's going to be devastating in terms of financial loss for everybody." The fast-moving fires have killed at least 26 people and left hundreds missing in an area less than an hour's drive from San Francisco. A charred entrance to the Nicholson Vineyards and Winery damaged by the Partrick Fire is seen in Sonoma, California, Oct. 11, 2017. Now, with at least 13 burned wineries, shuttered tasting rooms and thick smoke in the air from nearly two dozen fires that have charred more than 190,000 acres across the state, it is unclear how quickly the region can lure back tourists. Napa Valley welcomed 3.5 million visitors last year, with overnight guests spending on average $402 per day, according to Visit Napa Valley, the region's tourism marketing group. "There is a good amount of infrastructure that has burned down, homes have burned down, wineries have burned. 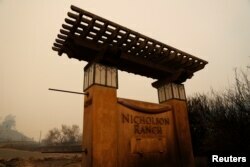 There are restaurants that are not going to open quickly," said Clay Gregory of Visit Napa Valley. 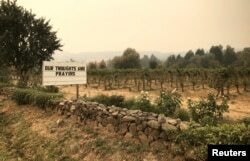 A sign is seen outside the Cline Cellars vineyards as smoke from various wildfires fills in the distance in Sonoma, California, Oct. 11, 2017. On Thursday, tasting rooms remained closed and the famous Napa Valley Wine Train, which ferries tourists through the vineyards, said it planned to reopen Sunday. Dozens of limousines and tour buses, their polish dulled by a film of ash, sat in a parking lot and warehouse on the outskirts of Napa. The company's owner, Michael Graham, said the business had just hit peak demand of 100 reservations a day, but since the fires that had slumped to two. Graham remains hopeful, however, citing tourism's quick recovery after the 6.0 earthquake that hit Napa in 2014: "People were out wine-tasting the same day." Graham said the region was still largely intact, with vast swathes of countryside untouched by fire. "It's just smoky. As soon as they get this contained it will be back to business as usual," he said. 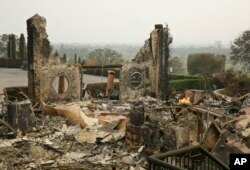 The remains of the Signorello Estate winery continue to smolder in Napa, Calif., Oct. 10, 2017. Others agreed the effect of the fires on tourism would be short-lived. Roseanne Rosen has fond memories of the trip with her husband to wine country that she just finished ahead of the fires. The couple from Kansas City has been coming for the last decade and has no plans to abandon that tradition. "It's one of our favorite destinations and I don't see that changing," Rosen said by telephone. "Once people are open and ready for business, we'd go back in an instant."